Dr. William Davey Crockett offers both in-office and take-home teeth whitening options at his Richmond, VA, practice to brighten patients’ smiles. If you want to achieve a bright, white smile, visit Dr. Bousaba to find out which teeth whitening treatment can help you achieve your goals. The simple procedure can produce stunning effects on its own or easily be incorporated into a comprehensive smile makeover. Whitening toothpastes, mouthwashes, strips, and gels line the shelves at pharmacies, but these over-the-counter products do not have the same effect as professional whitening systems. If over-the-counter bleaching products have failed to produce the level of whiteness you want for your smile, or if you desire a potent and fast-acting treatment, our in-office and at-home whitening systems may be exactly what you need. Teeth can have two different types of stains: extrinsic and intrinsic. As a cosmetic dentist, Dr. Bousaba can quickly determine which type of stains your teeth have, so you can pursue effective treatment. When enamel soaks up dark pigments in coffee, tea, sodas, wine, berries, or other dark foods, the resulting stains are extrinsic. That is, they occur on the surface of teeth. Extrinsic stains respond well to the topical teeth whitening we offer at Davey Crockett Dentistry. Our in-office and at-home whitening systems are far more effective than over-the-counter products. Discoloration that is within a tooth is called intrinsic staining. Intrinsic stains will not respond to topical teeth whitening treatments. You can, however, have cosmetic bonding or porcelain veneers placed to completely cover the staining. 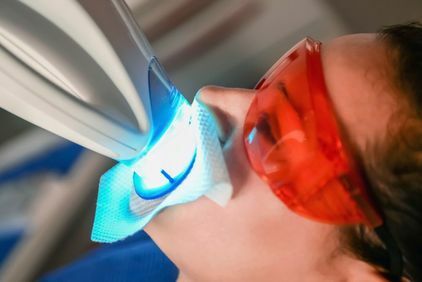 After researching many types of in-office, or chairside, teeth whitening, Dr. Bousaba found a light-activated system that he believes offers the most benefits to his patients. In-office whitening brightens teeth by eight to 10 shades in a single treatment. The appointment takes about one hour. 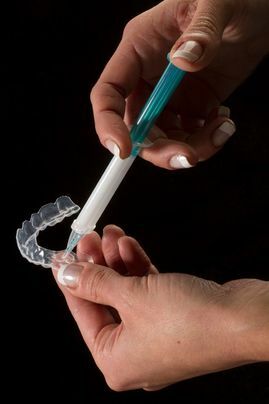 For in-office teeth whitening, Dr. Bousaba will apply a bleaching gel to your teeth, then initiate a chemical reaction by exposing the gel to a special light. When activated, the gel breaks up stains in the pores of tooth enamel, so they can come to the surface and be washed away. We offer an array of professional-strength home whitening options. At your cosmetic dentistry consultation, Dr. Bousaba will determine which system will work best for your lifestyle and goals. Most home whitening requires daily use for up to two weeks, and they produce results similar to in-office whitening by the end of treatment. The primary benefit of home whitening is the ability to undergo treatment whenever and wherever you like. Some patients use whitening strips just before bed, while others prefer to wear whitening trays during their daily commute to the office. In many cases, Dr. Bousaba recommends following in-office treatment with home treatment, as needed. This strategy allows patients to maintain their whitened smiles indefinitely. Whitening can also easily be combined with additional procedures, such as gum contouring, for even more noticeable results. For your teeth whitening consultation, contact us today and schedule an appointment. We are accepting new patients and look forward to serving you.